An original thinker, Captain Kirk took command of the Starship Enterprise as an admiral. He felt young. Characteristics: affiliation, Classic films , Admiral, any Kirk, any Kirk, Human species, matching commander, romantic partner. 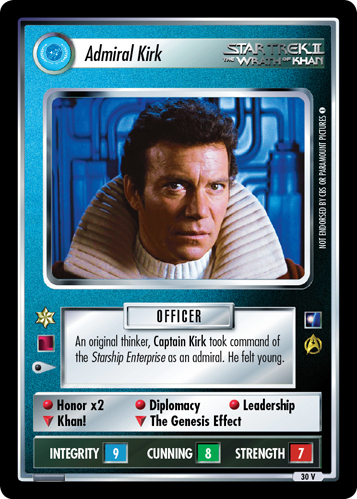 If you play OTF this card replaces the backward compatible 2E card James T. Kirk, Original Thinker from Genesis - ST1E compatible (the 2E card is no longer valide in OTF).